In what rooms can REJ Design heated drying racks be installed? REJ Design drying racks can be installed in bathrooms, shower rooms, laundry and utility rooms, toilets, dressing rooms, vestibules, foyers, craft rooms, cleaning cupboards, garages, and in many other rooms. Using a drying rack, you can quickly and easily dry and warm all towels, hand-washed items and outdoor clothes washed with water. It also gives additional warmth and removes excess moisture from the air. REJ Design towel warmers are suitable for new and renovated sites, homes and public facilities. They are also ideal for cottages and other holiday homes. What can I dry with a heated towel rail? Using an REJ Design drying radiator, you can easily dry towels, bathrobes, clothes washed with water, hand-washed items, outdoor clothes and children’s clothes. When washing more delicate textiles, microfibre cloths, synthetic and other technical materials and rainwear, we recommend that you place a towel between the textile and the radiator. You can also check out our range of drying rack accessories. Optional hooks and shelves are excellent aids for drying more delicate materials and adding drying capacity. How are REJ Design towel rails installed? Our heated towel rails always come with installation instructions. Installation instructions are also available on our website under “Products”. We recommend that water heated drying racks are installed by HVAC professionals. Installation must be performed using tools suitable for the installation site and the correct installation equipment, with professional expertise and care. Finnish/local building regulations must also be followed in the installation. Water heated REJ Design towel warnmrs are dimensioned according to Oras couplings (45 mm). Water heated REJ Design drying racks are compatible with Oras surface-mounted, eccentric and straight couplings. Water couplings are not included in the dryer package. When using surface-mounted angle couplings, it is important that the coupling is installed correctly so that the filler sleeve delivered with the coupling meets the sealing surface (otherwise, sharp edges might damage the drying rack seal over time). When installing, also pay attention to the straightness of the wall and couplings. The surface pressure directed at the seal must be even, i.e. the seal must face sufficient pressure across its surface area so that the sealing medium cannot penetrate inside the seal. Electric REJ Design towel rails are always delivered with a plug connection, and they are easy to install in rooms equipped with a socket. The length of the standard power cord is 130 cm. We can also cut the cord to a specific length for an extra charge. We can also deliver the drying rack with a 400 cm cord upon request. We recommend that the power cord of the device is used in fixed installation, and the drying rack location and the diameter of the cover flange are taken into account at the design/planning and construction stages. The easiest way is to install an installation tube of at most 16 mm behind the mounting foot. However, fixed installation of an electric drying rack (where the power cord is hidden) can only be performed by a professional or an authorised electrical contractor. 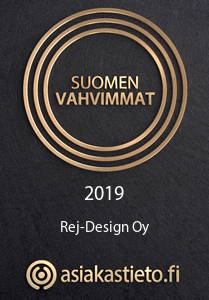 Are REJ Design products made in Finland? All REJ Design towel warmers and accessories are manufactured in Finland using more than 60 years of experience. They are Finnish products awarded the Finnish Key Flag Symbol and the Design from Finland label. Can I choose the colour of my REJ Design drying rack? The standard finish of our drying racks is chrome coating or white epoxy powder paint (RAL 9010). For an extra charge, you can order your REJ Design drying rack in different tones from the RAL colour chart or gilded with 24-carat gold. Please verify the availability of special colours before placing your order. If you order your water operated towel rail painted white or in a special colour, we recommend that you also order water couplings with your order. As a result, the cover flanges of the couplings come in the same colour as your drying rack. Note: Water couplings are not included in the towel rail package (see more detailed information). The delivery time of towel rails painted in a special colour is a little longer than that of standard products. Check the delivery time when placing your order. Are water heated REJ Design drying racks suitable for installation in the domestic water supply system? All water heated REJ Design drying racks are suitable for installation in a sealed heating system and in the domestic hot water supply system. They are made from type-approved copper. See more information about copper. According to the National Building Code of Finland D1, the themrmal output of a towel warmer connected to the domestic hot water supply system cannot exceed 200 W per room. The heat output of all REJ Design drying racks is less than 200 W. More information about the suitability of copper for the domestic water supply network is available on the website of Cupori Oy at www.cupori.com. Can I order drying racks manufactured according to special dimensions? Only water heated towel rails can be ordered according to special dimensions. Water heated models can also be manufactured with different connection distances and with top, bottom or side connections. Our drying rack models can also be modified to some extent, or they can be fully customised within specific production limitations. Furthermore, tilted versions of specific products in the Largo and Tango series are also available upon request, where the drying rack tilts outwards from the wall surface (the top is farther from the wall than the bottom). Special models must be ordered in writing: attach a drawing or a sketch, indicating at least the width and height of the drying rack, the number of horizontal bars, the connection distance and direction, and the distance from the wall surface. Also indicate the technical specifications of couplings (BT (3/4″) or 10 mm (3/8″) and the desired surface treatment (chrome plating or powder painting). The colours available for painted products can be found on the RAL colour chart. Please verify the availability of special colours before placing your order. Note: With regard to products from the Bamboo product family, the only possible modification is the conversion of the electric or water heated Bamboo Quartet drying rack into a straight model where the distance between the towel rail and the wall surface is the same at the top and at the bottom. In this case, the power cord of the electric Bamboo Quartet drying rack comes from behind the right- or left-hand top/bottom mounting foot, and the on/off switch is located at the end of the horizontal bar on the same side of the drying rack. The straight model of the water-heated Bamboo Quartet towel rail is only available with a bottom connection. Where are water and power couplings located? Water heated REJ Design drying racks are normally connected at the bottom, with water running through the bottom coupling. Models with a bottom connection can never be connected the other way around, with the bleeder screw remaining in the lower drying rack section. Drying racks equipped with a single bleeder screw must always be installed so that they can be bled from the top. Models with a top connection can be manufactured to order. Standard REJ Design models with a top connection are connected via the upper foot. Upon request, we can also manufacture water heated drying racks with a radiator valve connection (R 3/4″ connection from the end of the bar). Our models with a side connection are the Largo BTH 60404; Largo BTH 80404; Largo BTH 120404; Smart BTM 660, and Smart BTU 602, 602S, 502, and 402. The Largo BTH models can be connected from the left or from the right (Largo models with a side connection are equipped with two bleeder screws). Electric towel rails can be connected from any corner, apart from the Bamboo Quartet model, which has the power cord in its left- or right-hand top foot. The position of the power cord must be defined when placing your order. More detailed information is provided in the catalogue or on the website under “Products”. Can I install an electric towel rail as a fixture so that the power cord is hidden? All electric REJ Design drying racks are delivered with a plug connection. The length of the power cord is 130 cm. Upon request, we can also equip electric products with a 400 cm cord (ask our customer service for more information). All of these towel rails can also be installed as a fixture. Only a professional can convert an electric drying rack into a fixture. Only an authorised electric contractor can perform a fixed installation. In a fixed installation, we recommend that the position of the power cord and the diameter of the lead-through are considered at the design/planning and construction stage of the building/room. The diameter of the mounting flange of an electric drying rack is 43 mm and the thickness of the power cord is 8 mm. The easiest way to do a fixed installation is to make preparations at the construction stage. An installation tube dimensioned for an 8 mm power cord should be installed underneath the mounting flange at the mounting/connection point (maximum diameter 16 mm). Are REJ Design products type-approved/CE-marked? All electric REJ Design products are CE-marked and FI-certified. The protection class of electric drying racks is IP44 (resistant to splashing water). The authorities do not regard water heated towel rails as type-approved products (they are deemed to form part of the water supply network) and, currently, there is no European product standard or ETA for water heated towel warmers that would permit them to use the CE marking. In other words, no type approval can be obtained or CE markings used for water heated towel rails, regardless of the manufacturer or drying rack model. There is no type approval or CE marking for water heated drying racks because of an official decision on products within the scope of approval and the lack of a European product standard and ETA, not due to the product or manufacturer. All REJ Design heated towel rails comply with regulations, function properly and are safe to use. Rej-Design Oy has extensive experience in the industry: we have been manufacturing high-quality products for more than 60 years, and we also provide a declaration of conformity for water heated products. Where is the on/off switch of electric towel rail located? The on/off switch and cord output are at one corner of the towel rail. On the Bamboo Quartet and Bamboo Duo 2 models, the switch is located at the end of the topmost horizontal bar. On the Tango and Largo models, the on/off switch is located at the end of the vertical bar. The position of the power cord must be defined when placing your order, as this also determines the position of the on/off switch. Are REJ Design heated drying racks safe to use? Product safety and functionality are key factors for Rej-Design Oy. The safety of our products and their suitability for Finnish conditions are guaranteed by the FI certificate. All electric REJ Design drying racks are FI-certified. The electrical safety of our products is tested comprehensively, and a separate testing document is prepared for each towel rail. Impartial inspection body SGS-FIMKO regularly inspects type approvals and the testing equipment used, and ensures that the products are assembled and tested in accordance with guidelines and standards. SGS-FIMKO product certificates are available at www.fi.sgs.com/fi/home_fi_v2.htm?selen=27&. The protection class of all REJ Design electric drying racks is IP44, II, SPLASH (resistant to splashing water). Electric REJ Design towel warmers are heated using dry resistor technology (a double-insulated silicon resistor built inside the bars). The electric products contain no liquid. Water heated drying racks are manufactured from high-quality, type-approved Finnish copper, and all components are made from HVAC-grade brass. Water heated towel rails are always pressure-tested before surface treatment to ensure that the drying racks are watertight. Water heated REJ Design drying radiators can safely be connected to domestic hot water supply and heating systems. Read more about the studied properties of copper. What is the surface temperature of a heated drying rack? The surface temperature of water heated drying racks is approximately 55 °C (depending on the temperature of the domestic hot water supply or heating system) and that of electric drying racks is approximately 45-50 °C. The surface temperature may be a little higher or lower depending on the location of the towel rail, the room, ventilation and other prevailing conditions. However, the surface temperature will never be higher than 65 °C. Can the electric towel rack be on all the time? Does it consume a lot of energy? The energy consumption of electric REJ Design drying racks is very low, only 35–75 W depending on the model. Therefore, it is recommended that the drying rack is kept on all the time, especially in wet rooms. Our drying racks are made from copper, which has excellent heat conductivity. As a result, the product dries effectively, and the electrical resistance and energy consumption are low. The drying rack removes excess moisture from the air and, in this way, helps to keep structures dry, preventing water and mould damage. Electric towel rails, apart from the Smart EM 660 model, are equipped with an on/off switch with a signal light. The drying rack can also be switched off if necessary. Water heated drying racks connected to the heating system (radiator network) are warm when the heating system is turned on. A towel rail connected to the domestic water supply system is always warm. Note: According to Finnish building regulations, no regulating valve can be installed in a drying rack connected to the domestic water supply system, and the temperature of such a drying rack cannot be regulated using a thermostatic valve. Water heated towel rails are heated by hot water circulating in the domestic water supply or heating system, and their use does not accumulate any extra costs. Can a towel warmer alone heat up a room? Electric drying racks only consume the same amount of electricity as a light bulb, 35–75 W depending on the model. As a result, an electric towel rail alone is not a sufficient form of heating, but it offers comfortable extra heat and removes excess moisture from the air. Our product catalogue offers indicative values for the heat output of each drying rack. Painted drying racks transfer a little more heat than chrome-plated ones because paint lets heat penetrate more easily than chrome. As a result, the thermal output capacity of a painted drying rack is approx. 1.5 times better than that of a chrome-plated drying rack. The heat output of water heated drying racks is a little higher than that of electric towel rail because of the supply water temperature, which is usually above 55 °C. This means that a water heated drying rack (depending on the size of the model) is sufficient to heat up a room of 2–5 m2. REJ Design towel rails are made from copper. What advantages does this offer? We manufacture our products from high-quality copper. It is proven to be an excellent, durable, safe and 100% recyclable ecological material with which we have extensive experience. Corrosion-resistant copper has excellent heat conductivity, and it is a long-lasting material that does not change over time. Copper has low lifecycle costs. Copper prevents the growth of bacteria in the water supply network, and it has no taste or odour nuisances. Read more. How long is the warranty period of REJ Design drying racks? REJ Design drying racks have a five-year warranty period starting from the delivery date, provided that the product has been installed correctly. The warranty covers material and manufacturing defects. It does not cover any defects or damage caused by incorrect installation, use or repair of the product. More detailed warranty terms and instructions can be found on the “Products” and “Professionals” pages. What REJ Design accessories are available? Shoe/glove hangers (chrome-plated steel, 2 pcs/package) help you to dry socks, shoes, mittens and gloves. A chrome-plated Pivo shelf is available for the REJ Design Tango BTH 35744/EH 35744; BTH 35130/EH 35130; BTH 351310; BTH 50744/EH 50744; BTH 50514, 50655 and 50788; BTH 50130/EH 50130; BTH 40807; and BTH 40788 drying racks (Pivo Hyl 35, 40 or 50 depending on the drying rack connection distance/width). It can be used to store dry towels, suspend hangers or to dry more delicate textiles or as an additional drying rack. See more detailed information under accessories. What is included in the towel rail package? Our water heated drying racks come with installation, operating and maintenance instructions and a bag of hardware that includes mounting flanges (if they are not already attached to the drying rack), a bleeder screw, seals, fixing screws and wall plugs. The valves, water couplings and cover flanges required for installation are not included in the delivery. REJ Design drying racks have been dimensioned according to Oras couplings (45 mm). Electric drying racks come with installation, operating and maintenance instructions and a bag of harware that includes fixing screws and wall plugs. Mounting flanges are attached to the drying rack. The bag includes all what is required to install an electric drying rack to the wall, apart from tools. Electric towel rails are always delivered equipped with a standard power cord of 1.3 m. The operation of electric REJ Design drying racks is based on dry resistor technology (with a double-insulated silicon resistor installed inside the bars). Therefore, thesetowel rails do not contain any liquid and are ready to use. What do I do if my electric or water heated towel rails is not straight? Our drying racks are assembled in soldering stands, which ensures the quality of the stucture. During soldering, copper tubing softens, sometimes causing the structure of the rail to warp. Therefore, all our towel rails are inspected on a straightening stand after metal working phase and adjusted as required after surface treatment. Inspected, approved and ready the towel rails are packaged carefully one by one in sturdy cardboard boxes with supports. These supports prevent the drying racks from moving during transportation. However, the towel rails may be damaged if the transportation box is handled roughly or dropped. Our product packages include a “Fragile” marking, which indicates that the package needs to be handled with care. If required, minor bends in the drying rack frame can be straightened by hand before installation. Why is my towel rail not heating up? Check that there is no air inside a water heated drying rack. You can bleed it using a regular radiator bleeding key. Also check that the shut-off valves of the water coupling are not closed. Even a minor blockage in the installation valve or clogging can reduce the water flow. Water couplings are not included in the drying rack package, which means that they are not delivered with the towel rails. We recommend that you use Oras couplings, and we can deliver them to you upon request. However, an HVAC professional is responsible for selecting and installing the couplings at site. We also recommend that you ensure that the circulating pump of your water system is working properly. An electric drying rack should heat up in about three minutes. The towel rail will reach its final temperature in thirty minutes. For reasons related to electrical installation, one vertical bar of ladder-type electric drying racks is always a little cooler (but not cold) than the other bars. How can I clean the surfaces of my towel rail? You can use water and neutral or slightly alkaline (Ph 6–9) cleaning liquids (e.g. soap solutions and most washing-up liquids) to regularly clean the surfaces of your towel rail. Follow the instructions of the washing agent manufacturer. Dirt, scale and other deposits can usually be removed with soap and water. Please note that electric drying racks must be switched off before cleaning. Clean your towel rail rack with a moist sponge dipped into the washing solution or with a soft cleaning cloth, rinse it clean several times with a moist sponge dipped into clean lukewarm water or with a cloth, and dry all the surfaces. Do not use any abrasive agents, other polishing or corrosive agents or cleaning equipment, solvents or agents containing acids or ammonia on chrome-plated or painted surfaces. Chrome surfaces cannot withstand, or withstand poorly, phosphoric acid and chlorine compounds. If a chrome plated drying rack blackens in places over time, you can clean these areas by using liquid cleaning agents for silver. Note: After cleaning, the surfaces must be rinsed thoroughly using a moist sponge dipped into water and wiped dry. After cleaning, chrome plated towel rails can also be treated with a chrome polish, following waxing instructions. A waxed surface repels dirt and water, and makes it easier to keep the product clean.